Okanagan Falls, Okanagan Valley, British Columbia, CanadaA richer version of the 2014, with much darker, blueberry aromas and characters but still with enough acidity to keep it fresh. The attack is firm and relatively dry with a pleasant, savoury, rustic undercurrent and firm but accessible tannins. There is no need to rush to drinking this but it is kind of fun to gulp now. If you don’t cellar this through 2020 try it with barbecue pork. Mclean Creek Road Vineyard is on the home site. Its relatively steep slope faces south, west and northwest and sits over a mix of stony/sandy alluvial and glacial deposits. The vines mix five different Burgundian clones, both Pommard and Dijon, on three distinct blocks. 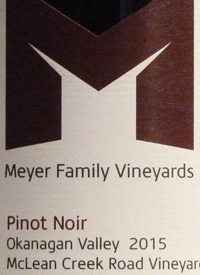 Each block is managed separately using organic principles.Tasted: 08 August 2017Tasted by: Anthony GismondiPrices: BC	40.00	winery direct Producer: Meyer Family VineyardsDistributors: International Cellars Inc.